Go to any McDonalds and make a right. Go 2 1/2 miles and you will see the Nail. Alright, maybe not. Be sure to call the Nail first, but it's close. Take 76-West (Schuylkill Expressway) to the City-Line Ave.or City ave. Exit. 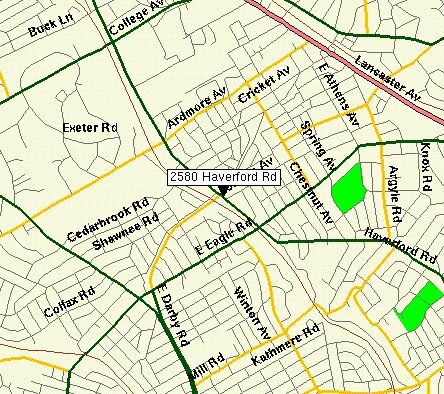 Follow City-Line Ave. three and a half miles (when you see a 2nd Mc.Donalds on the left), make a right and go on Haverford road. Go approximately two and a half miles or eight traffic lights to arrive at The Nail! The Nail will be on the left hand side. Take 476 (Blue Route) to Exit 13 (old 5 exit) (Villanova Exit). Take route 30 East (Lancaster Ave) for one and a half miles. When you completely pass Villanova University at the bottom of the hill there is a McDonalds. Make a right at County Line Rd (in fact you can only go right). Go two and a half miles (it will automatically change to Haverford road) or to the second 7-11 on your right hand side and immediately park in the ARDMORE JUNCTION SEPTA LOT parking lot on the right hand side. We're right next to the 7-11. FROM PHILLY BY TRAIN.........TAKE " BLUE " LINE TO 69TH STREET. THAN " R100 " TO THE " ARDMORE JUNCTION " STOP. WALK TOWARDS 7-11. WE'RE NEXT TO 7-11. SEPTA WILL HELP YOU WITH DIRECTIONS AND SPECIFIC TRAINS WHERE EVER YOUR COMING FROM. SEPTA PHONE NUMBER IS 215 580 7800. Always park in the SEPTA parking lot ( Ardmore Junction ) next to 7-11. If you encounter any problems or if you are lost then give us a call at 610-649-NAIL (6245) and we'll help you out!